Description: Drive your taxi through the city, pick-up customers and take them to their destination. Negotiate the turns in such a manner that you will not touch pedestrians or other things. Make sure your damage bar does not reach zero, because your car will destroy itself and you will not be able to reach the customer. If you destroy your taxi, you will have to start the level all over again.. 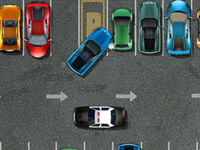 Taxi City Parking is a Parking Games.